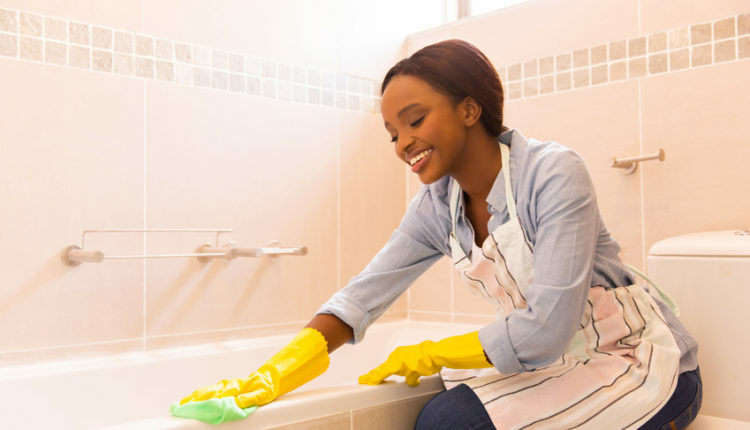 With kitchen, the other place in your home which needs to be cleaned perfectly is none other than your bathroom. 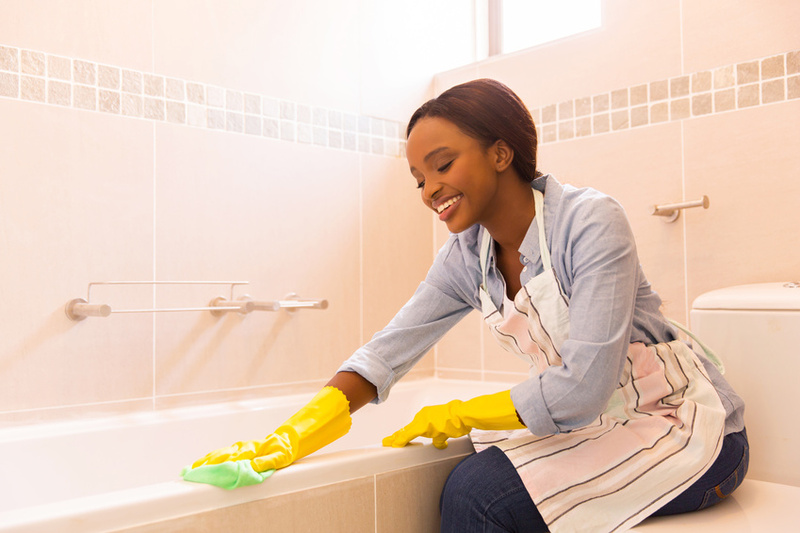 Sufficient amount of time is needed to clean up the bathroom because of it has different variety of surfaces. It needs to be cleaned regularly because of its regular and frequent usage. Most of the people doesn’t like to clean up the bathroom, and it’s their least favorite to clean because of the obvious reason. But, some tips and tricks can help you with the proper cleaning of bathroom. Fortunately, a to do list and some good cleaning agents can help you with quick cleaning. Just like windows, your mirrors wall mounted on your bathroom can be cleaned with a 50/50 mixture of water and vinegar. Mix the mixture and fill it up in spray bottle and spray all across the mirror. Use an old cloth or a cut up t-shirt or newspaper to clean up. The best way to clean up the mirror is to use the microfiber cloth. Soak it with water and rub the surface of mirror without the need of any chemical to clean. You can use the microfiber cloth to clean up all the counters, tiles and showers easily. Well if you don’t have the cloth, don’t worry. Here are mentioned some great natural options, that would work great too. A 50/50 vinegar and water solution will work great too. Fill them in spray bottle and spray all over your counters, tiles and showers. Use any cloth to rub it clean. Baking soda with a mixture of water or vinegar will clean the stuck up dirt on the showers or basins. Use it frequently. For tough stains, mix baking soda with hydrogen peroxide and mix it with water. Sprinkle all the mixture on the floor and scrub it with the bathroom’s brush. Use baking soda, and sprinkle it all around the toilet. Use undiluted white vinegar with water and rub it thoroughly. Do this process once in a week. This trick also works to remove all the bad smell from the toilets. To decrease the bed smell from your bathrooms increase the amount of air circulation and light to decrease the moisture. Use the ventilation fans during showers to decrease the humidity in washrooms and to increase fresh air passage. Modern cleaning products don’t just remove dirt they also leave the harsh chemicals behind with them. Try to use old fashioned methods to clean up the washroom. Use baking soda, vinegar, or white vinegar to clean up the mess. Every month or two, give the drainage pipes a good protective cleaning to keep them clear of grease, oil, and hair blockage. Pour 1/2 cup baking soda down the drainage, followed by 1/2 cup white vinegar. The mixture will foam up. Let stand for a few minutes to dissolve fatty acids, then pour boiling water down the drain to wash out any clogs. Clean the soap residue by using an acidic cleaner all over the surface. It will not only clean the surface but will also clean the left over residue. If showerhead becomes clogged with dirt and grime, don’t worry. Fill a bag with undiluted white vinegar and place the bag over the showerhead. Soak overnight and then scrub with any piece of cloth. The use of chlorine bleach is very affective in cleaning the toilet bowls. Add 1/4th cup to the toilet bowl, let it stand for some minutes then use a cleaning brush to clean all the flush. This will help in disinfection as well.